Carl’s ego strength continued to increase and he soon began to clash with Mary. He openly expressed his anger when she tried to conceal his age from her friends, would not disclose his occupation or income, objected to his interests in his family or became overly possessive. During the group sessions, he focused on evaluating the positives and negatives, as well as future outcome of their relationship. “Even if she decides to marry me on an impulse, I wouldn’t do it.” He became increasingly aware of the maternal role Mary symbolized for him, i.e., the ambivalent feelings he had towards his mother—strong dependency needs, coupled with intense anger at having to subjugate his own wishes in return for acceptance and affection. As a result of increased understanding and ego development, he began to wean himself from Mary. The separation was devoid of the anxiety and depression experienced as a result of parting from his wife. In the group sessions, he expressed empathy for Mary and manifested understanding for her needs. Although he continued to correspond with her, he persisted in declining her invitations to visit, even when she appealed to his affection for the children. Limiting his involvement with Mary, Carl initiated and participated in a number of social activities; he attended social gatherings for single people, meeting and dating and visiting several women whom he liked. He developed ability to relate to women with ease and enhanced as well as reinforced his ego strength. Carl’s growth and development also became manifested in his occupational pursuits. In seeking advancement, he found a job opening with an urban renewal development project. He studied for and passed a qualifying examination and was immediately hired as a district manager at a relatively good salary with possibilities for advancement. Reexamination of the analytic group process, i.e., working within the transference and multiple transference relationships, revealed the forces enabling Carl’s psychotherapeutic progress. After working through his initial anxiety related to his need for acceptance, Carl interacted with the group freely and spontaneously. He experienced the group in transference with his family; understanding and acceptance by the other members enabled Carl to disagree with them and to assert himself. These were reactions he could never allow himself to have in his own nuclear family. He expressed many positive feelings for one of the women (Gladys), whom he saw as his long-suffering mother. Another female group member (Betty) provoked intense, underlying resentment, which he had originally experienced from his silently demanding mother. He identified another female member, Ruth, as his helpless sister, who was unable to bring about changes. The fourth female, Alice, was symbolically experienced as his seductive, unavailable former wife, as well as his mother, whose affection he continually, but unsuccessfully, sought. The strongest multiple-transference relationship was to a male group member (Harry), in whom he saw his irascible, rejecting father, and at times, his younger brother, with whom he was an unsuccessful rival for his mother’s affection. He anticipated, sometimes provoked, and always reacted to Harry’s exploitative view of sexual relationships with women with intense hostility, reminiscent of the feelings for his father, who abused his mother. The transference relationship to the therapist (female) was a strong, dependent attachment to “mother.” Overt, emotional reactions were limited to positive feelings expressing extreme gratefulness “for all the help” given. Even when the therapist attempted to provoke and surface the negative feelings against which he was defending himself, Carl was unable to express any hostility. With the continuing development of ego strength, gradual, persistent stress was placed on his increased capacity to express feelings. After a period of a few months, he was finally able to chance disagreement with the therapist. An occasion arose when the therapist made a remark to the effect that Carl was trying to prove his love to Mary by becoming “a good uncle” to the children. He reacted with intense anger. Following the session, he wrote a letter full of apologies. At the next session, he again apologized. Apprehension of becoming independent of the nurturing mother figure had set in. He became frightened of losing the source of possible gratification for his dependency needs. Continued interaction within the transferential . relationships provided an opportunity for Carl to see that the expression of anger did not destroy “mother” or even significantly modify their relationship. Carl’s psychotherapeutic progress is no exception. It is typical of the effects that can be obtained in a homogeneous, age-range psychotherapy group. The personality development and characterological changes illustrated, however, should not be taken as an indication that group psychotherapy, even in a homogeneous age group, is a panacea for all persons over sixty who suffer from emotional disturbances. A patient’s entering into a group does not automatically establish a psychotherapeutic relationship between him and the therapist. It is most important, actually essential, that the patient understand the psychotherapeutic contract between himself and the therapist. This contract includes the patient’s investment of time, energy, and agreed-upon monetary fees (the author has found that the payment of monetary fees is not always an essential for psychotherapeutic progress). In exchange for the therapist’s knowledge, effort, and time to aid the patient in bringing about beneficial changes, resulting in a more constructive and fulfilling life, the contract also includes the patient’s willingness to attend the group therapy sessions throughout the course of treatment. Although it is not essential to explain every aspect of the group therapy process, it is both good therapy and advantageous for the therapist to clarify and reassure the patient regarding some of his possible reactions during the initial phase of group therapy. As occurs in all age ranges, the older person may experience discomfort and feel that “I don’t fit in with this group of people.” Upon entering the group, he should be made aware that there are individual differences and that some people take several sessions before “fitting in” with the other group members. It is also essential that the patient understand the importance of his reactions to other members in the group. It is a good procedure on the part of the therapist to be available and let his availability be known, so that the patient may seek him out if unable to verbalize intense, anxiety-provoking reactions in the group situation. If the therapeutic contract is not clarified and accepted by the patient, it is very likely that a lack of early adaptation or adjustment to the group therapy process will result in the patient’s flight. The therapeutic effects may also vary, depending upon the individual patient’s needs, desires and aspirations. Some patients enter into therapy with the exclusive, limited goal of reducing their anxiety, which is manifested by “nervousness” or “depression.” There are some who seek to work out familial conflicts with spouse or children; a few, even though past sixty, experience frustration and seek to bring about personality changes leading to more optimal utilization of their potential and satisfactory fulfillment of constructive aspirations. The therapeutic progress of each patient will depend to a greater or lesser degree upon his respective goals, preparation for group psychotherapy, and acceptance of the psychotherapeutic contract. Profile of a Therapy Group. Perhaps the best illustration of the possible effects of group psychotherapy with both positive and negative manifestations with older people is to review such a group from its inception and over a period of years. This particular group, homogeneous in relationship to age range, was initiated in 1956 and introduced a gerontological program in a community mental health center. The patients involved were referred by physicians, relatives, social agencies, and other sources who had learned of this new psychotherapeutic program. The only qualifications or restrictions were age (patient must be at least in mid-fifties) and that the patient was willing to accept group psychotherapy as the treatment modality. The group was initiated and has continued up to the time of writing as an ongoing, open group (patient members entering or leaving or completing their therapy at any time). Some time after its inception, the group became part of a training program. 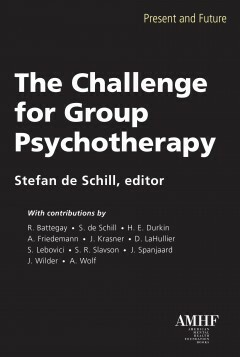 The author, the first therapist, was with the group for about three years. The group has since had several therapists, each, with one exception, remaining with the group for one or more years. The author has continued to maintain contact with the group, usually in a supervisory capacity. At the time of writing, all of the initial members of the group, again with one exception, have terminated therapy. One of the original members has remained in the group over nine years. Although this may appear to be a long period of time, the patient, Jack, has continued to make significant progress, which has warranted the time and effort spent. The patients to be discussed will include the eight initial members who entered the group during the first few months of its formation. These patients were all voluntary and had been referred by physician, friend, relative, or social agency. They were representative of a cross-section of the middle socioeconomic population. The vocational areas represented included: college professor, bookkeeper, engineer, nurse, business woman, window cleaner. All group members were, or had been, active in some business or profession. As previously mentioned, selection of patients for the group was limited only by age and the patient’s acceptance of group therapy as a means of help. The initial age range was from mid-fifties to the mid-sixties. Also, each of these patients had been referred for psychological tests and complete physical examinations before entering the group.